Two watercolours today. I usually use gouache in my flower studies, but I have always wanted to master them in pure watercolour. So I thought I would practice today and this is the result. It was hard not using white but with a bit of practice I think I will get there. Not a 100 per happy with them, but they will make nice postcards for my give away. 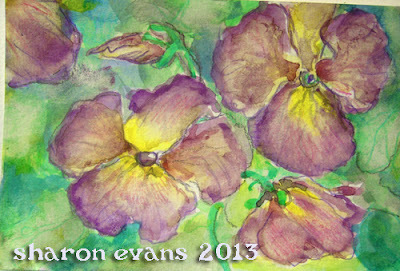 I have heaps of these flowering in my garden at the moment, only polyanthus and pansies seem to flourish in our winter. Although I noticed that some jonquils were starting to bud up. Last week’s give away winner was Christine at Christines Blog, I have left my email address on her last post, so Christine choose 2 postcards from the postcard page and email me your snail mail address and I will send them off to you. If you want to win some postcards leave a comment and you will go into the draw. Have a happy creative week everybody. Thanks so much Sharon, I'm delighted. Will get back to you on my choices. Actually, I like Pansy 1 and 2. These ones you have just done. Thanks again and I will email you my snail mail address. These are so lovely - and I can't pick between them, loving them both! Botanical themes seem to abound today :-) xo L.
These are lovely. The colors in both are very pretty. We have been having rain, rain, and more rain. Our flowers are very happy. Beautiful, Sharon! 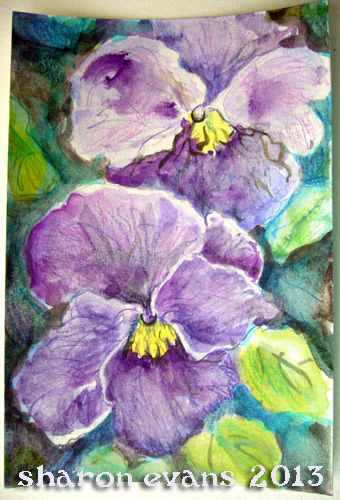 Pansies are some of my favorites. I know what you mean about it being hard not using white. I love the white of the page so much but I often go too far and have to add some back in. Always a challenge! These are really beautiful! They are motivating me to do some flower studies too. Delicate and lovely. We're having a tonne of rain too. It seems to be making everything grow...even my kids...lol. Beautiful watercolors, lovely translucent colors! And the pansies are so lovely too! They belong to my favourite garden flowers and therefore I herewith also would like to confirm how happy I would be if you keep me in the loop for your giveaway! I'd love to be included in the draw - and - just a question - are you interested in a postcard swap? I am quite happy to swap!